This episode is about golf. A game enjoyed by millions. It’s something I don’t like all that much. First off, who has the time? Typically, it takes about four hours to play a round. Add the time required to drive to and from the golf course, warm-up time and time for a post-game drink or two with the rest of the foursome, and you’re talking about six, maybe even seven or eight hours for the whole affair. That’s a BIG chunk of time for someone with a busy life. It’s also a game that requires a good bit of skill, and therefore requires a good bit of practice. So that’s even more time required. Given that the game itself consumes more time that I really want to allocate, how much time do you think I invest in practice? Yeah… Not much. Actually, it could easily be 15 years – or even more – since I actually practiced the game at all. Which leads me to the next issue. I do, in fact, get together with three buddies once a year for a golf trip. And every year it’s an ego-bruising experience. I watch the three of them – who unlike me are all avid golfers – whack their drives 200+ yards down the middle of the fairway, and then slice my own shot out 50 yards or so, off to the left, into the trees. Then I stumble through the underbrush hunting for my ball. Assuming I can find it, I next have to to hit it back out of the woods. Not infrequently, that next shot collides with one of the relentlessly ubiquitous trees, sending the ball in a totally random direction and setting off another stumbling search through the underbrush. And do you think the three guys with me, whom I’ve known forever, keep their mouths shut? Yeah, right. They are guys after all. They pride themselves on coming up with new and ingenious insults at my expense at every opportunity. OK, not a big deal on the first hole. I can handle it. But there are 18 holes! How many times can anyone repeat that sort of process before the “what the hell am I doing out here” thought comes to mind? And did I mention water hazards? And sand traps? And how often you wind up trying to hit the ball while standing on an up-slope, down-slope or side-slope? The whole freaking game is designed to present you with one headache after another. 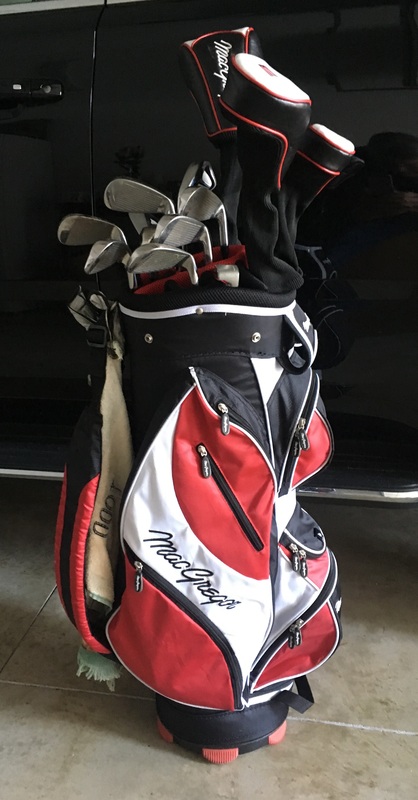 Given all that, and especially my once-a-year golf playing schedule, it should come as no surprise that the set off-brand, copy-cat golf clubs I bought on sale in 1996 seemed perfectly adequate. A few dings and rusty spots here and there for sure, but those blemishes match up nicely with my skill set and frequency of play. Which leads up to the day when the razzing and cheap shots from my alleged golf buddies started in the parking lot. I was informed that I was to store my vintage golf clubs in the nearest dumpster. They were – supposedly – an embarrassment to the group, the course and the grand old game of golf itself. It’s not about golf. My golf buddies really are my buddies. Yeah, I only play once a year, but it’s with these guys. And 2019 will be the 28th year. And to be even more accurate, in 2017, they convinced me to get together for a golf trip twice a year. For the math challenged, that means I’m now playing golf twice as much as I have since before high school. Not only that, the new technology embedded in my new clubs really does make a difference. A little bit more frequently now, it all comes together. The swing feels right. The club to ball contact feels right. The satisfying thwack sound, sounds right. The ball goes up in the air and actually flies directly toward the spot I aimed. There’s that little adrenaline rush. The confidence that the shot can be repeated. The genuinely pleased – albeit somewhat surprised – shouts of “nice shot” from my three companions. There’s this deep-seated sense, no… confident knowledge, that I can do it again. An undeniable craving to do it again. In fact, I just did. This past weekend I drove down to Florida to meet up with one of my normal crew who lives there. Thirty-six years ago, I was best man at his wedding. His son and his son’s buddy, who was his best man two years ago, escaped for a few days from their Minnesota winter to meet up as well. To protect the innocent, suffice it to say that a good time was had by all. The young guys had more stamina. The old guys had more and better stories. So now I guess I’ve tripled my annual golf outings. I’m your Intentionally Vicarious host, Todd Youngblood – and I remain a lousy golfer. But it’s not about golf. It’s about buddies. And about the next generation of buddies determined to outdo my generation of buddies. It’s about having more fun than anyone else I know.